NRA Flack: We Just Met With Trump And He Supports Strong Due Process, Doesn't Want Gun Control - Joe.My.God. Trump met with the head of the National Rifle Association’s lobbying arm, who stated after the Oval Office sit-down that the president is a steadfast supporter of its pro-gun agenda. 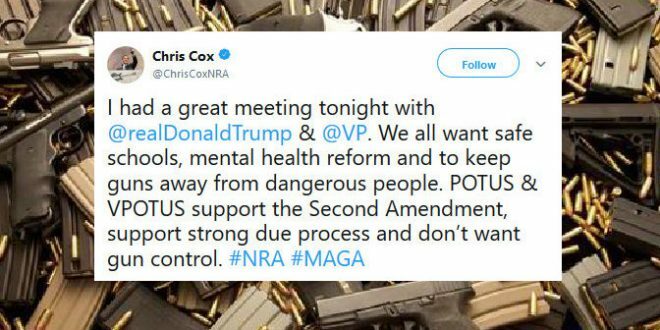 Chris Cox, the executive director of the NRA Institute for Legislative Action, said that the president supports the Second Amendment and safe schools — but not gun control.